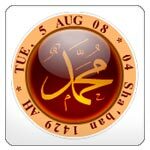 View and download Islamic Calendar! Below you will find a table of the yearly islamic calendars for the years around the current year of 2019. They are available in two versions: the Umm-ul-Qura Calendar (which is used as civil islamic calendar in Saudi Arabia) and the Global Islamic Calendar which is based on sighting probability of crescent moon globally. The two versions of the islamic calendar mostly has the same dates, but sometimes they differ on the length of certain hijri months. 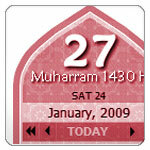 Use this islamic calendar tool to find out the islamic hijri dates from any gregorian or chritian era dates. 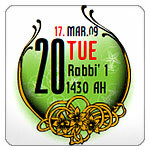 Below is a collection of free islamic calendar widgets that you can put and display on your blogs or websites. The widgets are flash-based and can be embedded in many open social or community websites like MySpace, Multiply, Friendster, Blogger, Ning, Hi5, iGoogle, Hadithuna, Typepad, Netvibes and more. Go no where else to know the current hijri date. Browse and choose the design that you like. 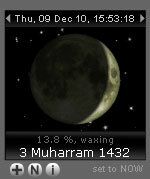 Most of the islamic hijri calendar widgets below are customizable. In other words you can design your custom calendars or personalised calendaras. You can set the size and look or color of the calendar to match the layout of your blogs or websites. The displayed hijri calendar date is based on the latest formulation of the Ummul Qura calendar of Saudi Arabia. UPDATE: I have decided to change the hijri date calculation code or algorithm for most of the hijri calendar widgets here. It is now has now an option to set the calendar based on the Suggested Global Islamic Calendar proposed by Dr. Khalid Shaukat from the Fiqh Council of North America. Nevertheless, you can adjust the islamic date by a few days to synchronise with the current date in your country. This cute little muslim holds a plakat showing the current hijri date. There are several choices to dress up the little muslim: make it a boy or a girl, wearing headscarf or bald, choose the hairstyle, the choice is yours. Play with it! Date added: 26 May 2008. This glass orb will put a shine on your page (for real, you will see the shine reflected on the surface). And there is more, you can choose the orb color! This sticky note will always remind you and the visitors of your blogs about the islamic hijri date. It is not only yellow in color, choose whatever you like. I created this design to get attention. The contrast of the color will surely attract visiting eyes and therefore be reminded of the current date in islamic calendar system. 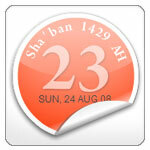 This sticker shows the current hijri date. With this design, I want to display both the christian and hijri date in one place, aesthetically. And for the day name, I use the arabic names (the english transliteration may not be familiar in other languages). This glassy bar button is for those who are limited in space. The bar will not occupy much area on your blog, yet attractive enough. This animated bar is my favorite. It shows the current date in both christian era as well as in islamic era. And it shows them alternatingly via smooth animation. Date added: 24 June 2008. This widget's design was inspired by a real calendar design which take use of the CD case both as a packaging for the calendar as well as the stand. Now you can have it virtually sit on your blogs with added background animation. Date added: 17 Jul 2008. The same as above, but facing to the other direction. So, you have better choice when putting this calendar on your sidebar. Right side or left side. This widget's design was actually already in the collection of image-based calendar. I just port it to the flash, so that users can have more options regarding the colors of the calendar. Date added: 30 Jul 2008. This design was a modification of the designs in my islamic clock widgets. Now, is it is to show the hijri date, I made a rotating circle around the glassy orb which can be decorated with calligraphic ornament. Date added: 05 August 2008. This is a classic wall calendar design showing a slideshow from flickr. There are several themes availaible: islam, qur'an, mosque, islamic art & architecture, muslim, muslimat, Ka'bah in Makkah and Dome of Rock near masjid al aqsa. The calendar will retrieve 40 most interesting pictures from flickr based on the selected themes then put them as a slideshow. Date added: 10 August 2008. Date added: 24 August 2008. 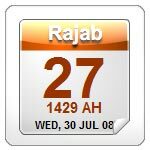 Sometimes we want to know what date it is today in islamic hijri calendar system. Or aren't you wondering when is your birthday in hijri date? Or you might just want to know when the Ramadan starts this year. Then this widget will suit your need. It is styled to beautify and decorate your blog or website and is customizable. Date added: 26 January 2009. As the lunar month of the islamic calendar is tightly correlated with the phase of the moon, I decided to design this widget that shows the current date in both gregorian and hijri. 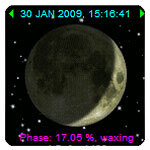 This widget may be called an astronomy widget, while it displays not only the current phase of the moon, but also the age, the date and time of the last and next new moon, as well as the full moon. Date added: 04 February 2009. Lately, the floral and swirl ornaments become a popular design element in almost all types of publication. Although a few of the widgets have already incorporated such element, here is another one for the hijri calendar. In addition this widget features animated floating flower bubbles. Date added: 18 March 2009. This is a redesign of the "Current Moon Phase Widget" which shows rather colorful infos about the current phase of the moon, the current date and the corresponding hijri date. Now, this widget shows a cleaner and simpler color theme, with only white and greys. Date added: 04 January 2010.